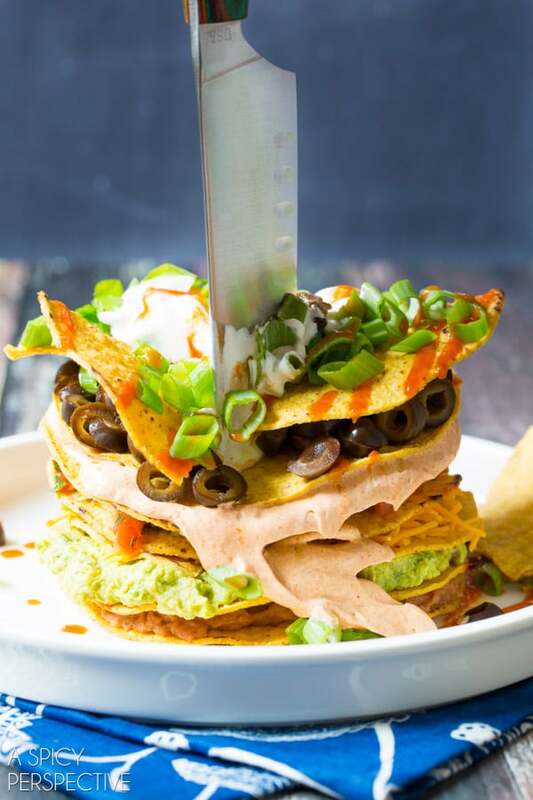 A twist on the classic seven layer dip, with towering toppings, and chips built in! 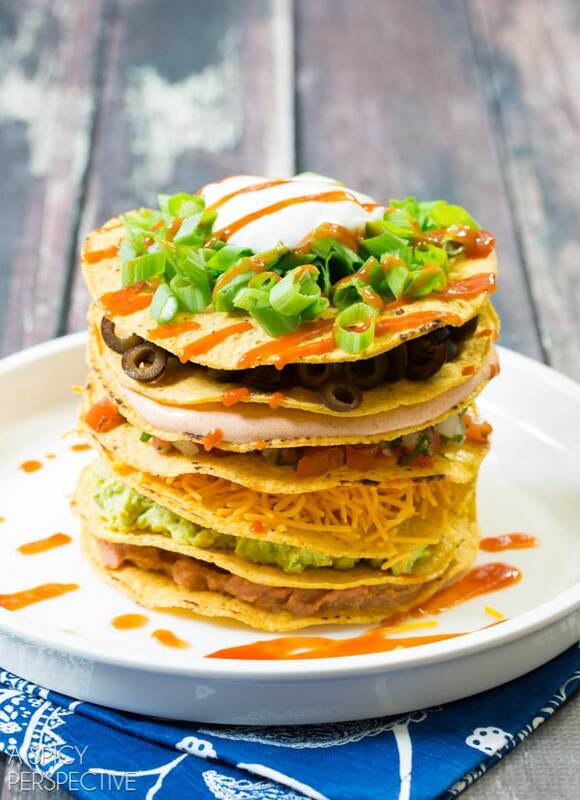 This 7 layer dip tostada stack is not only a site to behold, it’s an irresistible party favorite making a stylish come-back. 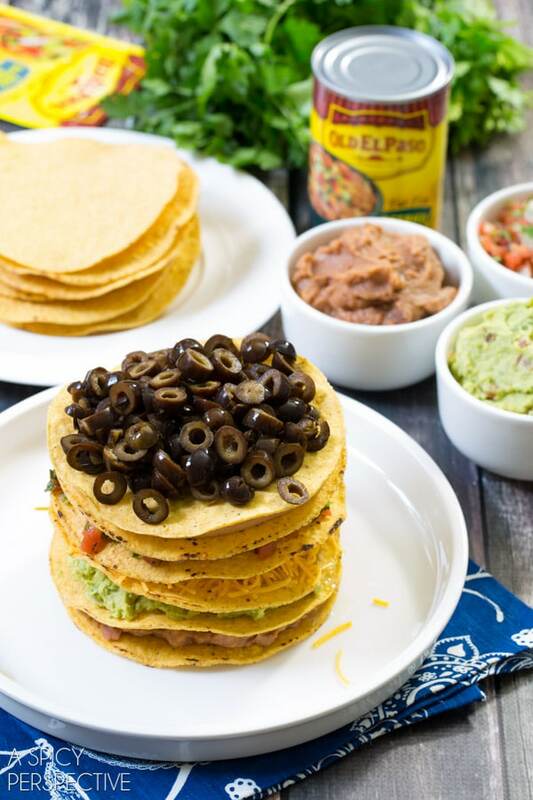 Growing up in the eighties, I can’t remember a single gathering we attended that didn’t have a Mexican-inspired seven layer dip somewhere in the mix. It seemed every mamma in our neighborhood, had their own variation of 7 layer dip. Some added a layer of cream cheese. Some added spicy shredded chicken. Others used black beans instead of refried beans. As a kid, I always loved dipping my chip deep into the layers, scraping the bottom of the dish with hopes of scooping up a little of everything. Sadly, in the nineties the seven layer dip disappeared from parties across America, leaving a gaping hole in the hearts of snack-lovers from coast to coast. Some might think of this as “progress”… believing the 7 layer dip was over-done and going out of style. Yet I believe any dish as vibrant, versatile, and enticing as the classic seven layer dip should have a permanent place in American culture. Let’s bring it back, shall we? Today I’m hoping to spur on a fresh love of this retro party dip. Stirring up nostalgic cravings in those my age and older, and maybe introducing this as a new concept in our younger readers. 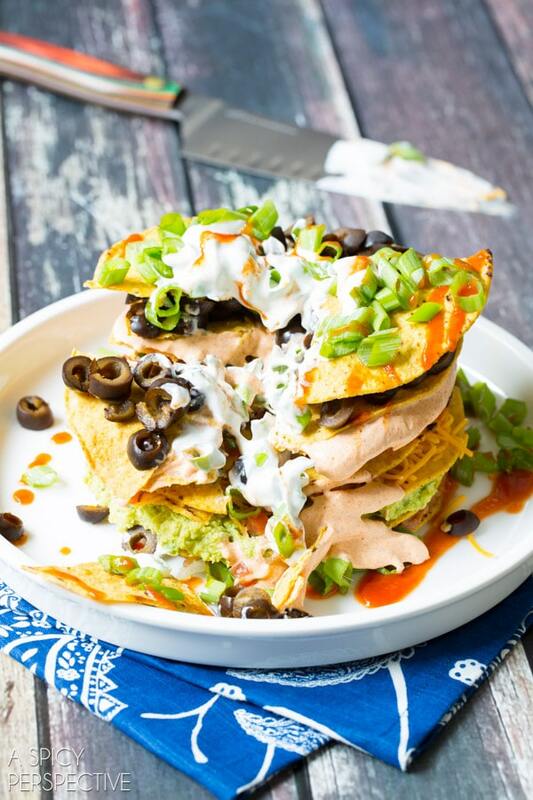 Traditionally, Seven Layer Dip is assembled and served in a casserole dish, with tortillas chips on the side. 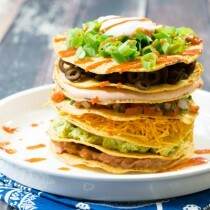 However, I thought is would be fun to bring it back with a fresh twist, by stacking each layer with the chips built in. I used Old El Paso Tostada Shells as the chip base for each layer, then plied them high, alternating colors and textures. 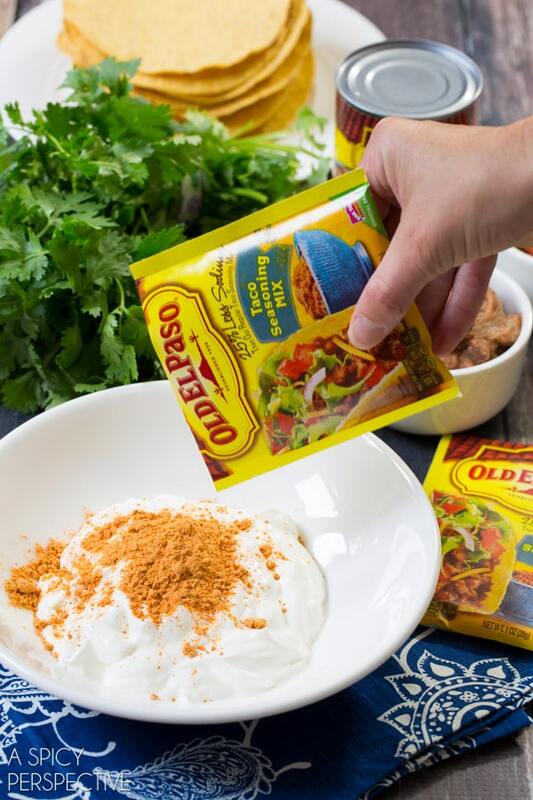 My secret ingredient is a sauce made of Old El Paso Taco Seasoning and sour cream… You will not believe how addictive this little two-ingredient wonder is! 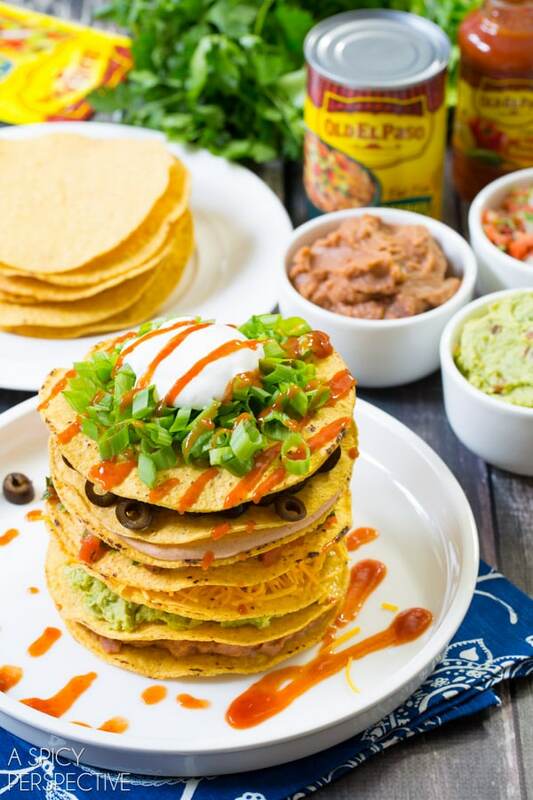 These fun and festive tostada stacks make great centerpieces on your party table. When you’re ready to serve, drive a chef’s knife down through the middle to break up the chips. Scoop the sour cream into a bowl and add the packet of tacos seasoning. Stir to combine. Lay out all 14 tostado shells. 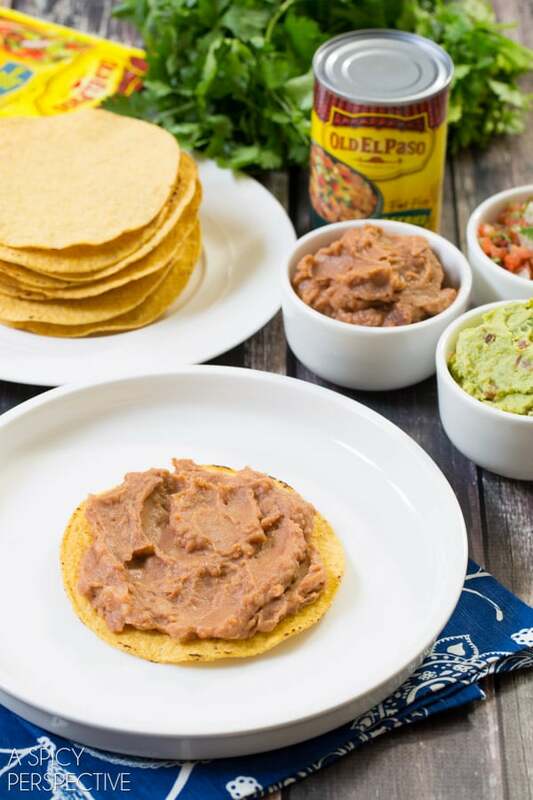 Spoon refried beans on two tostadas, spreading to flatten. Spoon guacamole on two tostadas, and flatten. 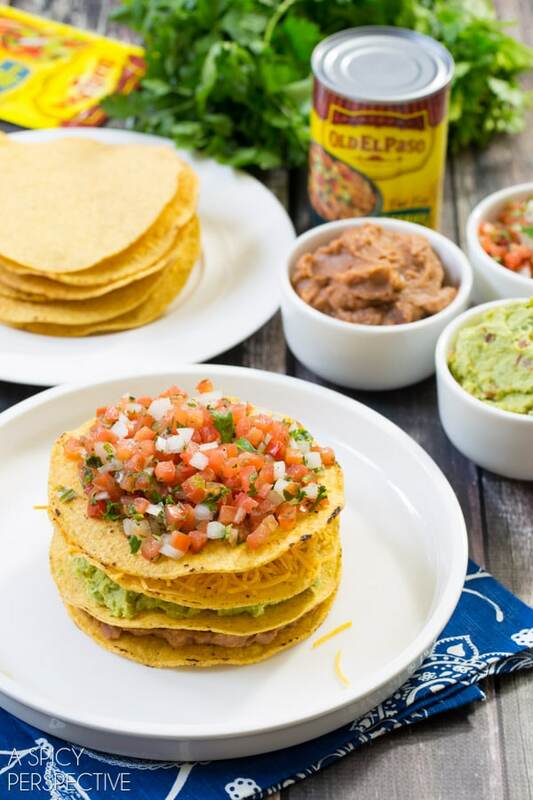 Spoon the sour cream sauce on two tostadas, followed by the pico de gallo on two tostadas. Repeat with the cheese, green onions and olives. Then place the bean tostadas on two separate plates. 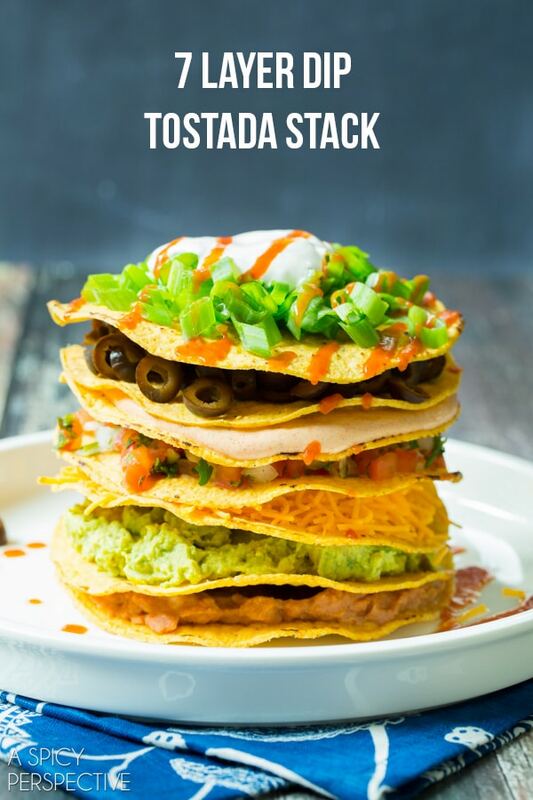 Stack them with the various tostadas until each stack has seven tostadas with seven different toppings. 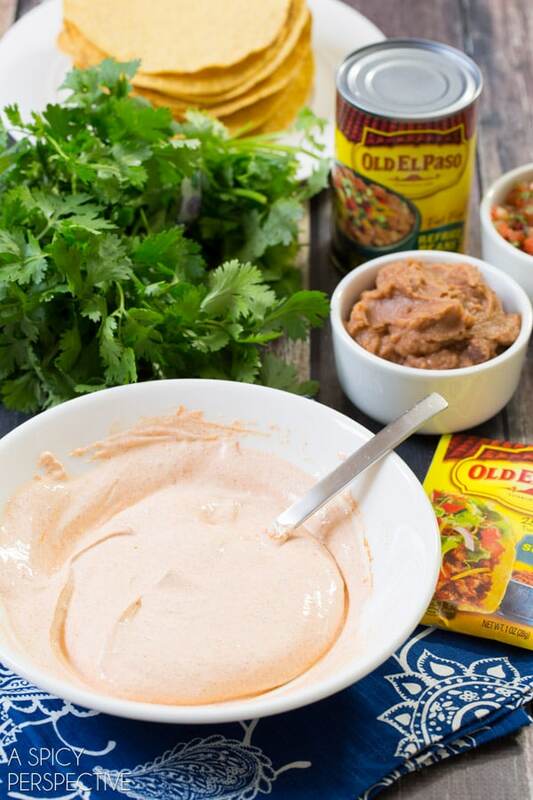 If you have any sour cream (or sour cream sauce) left, add it on top, then drizzle with Old El Paso Taco Sauce. 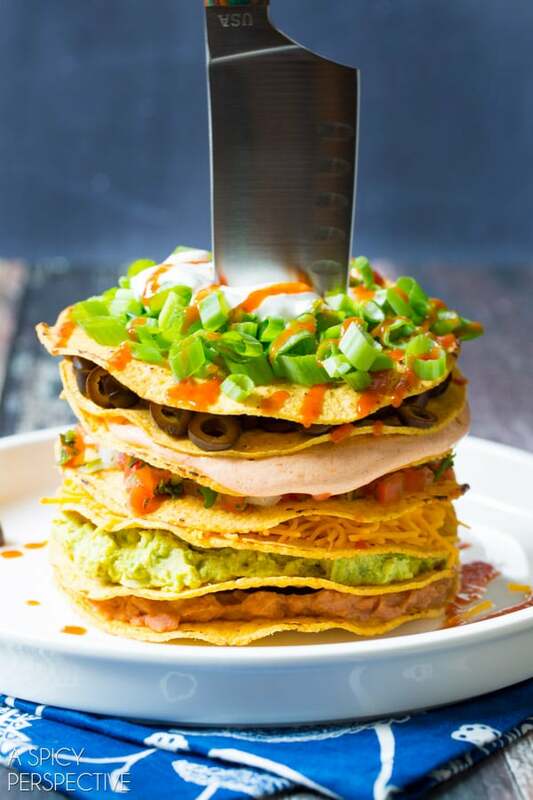 When ready to serve, press a chef’s knife down into the center of the stack a couple times to break up the tostadas. Enjoy! Disclosure: This post is sponsored by Old El Paso, but of course, all opinions are my own.